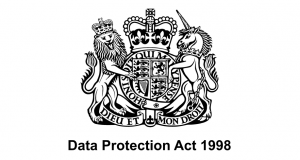 The Data Protection Act 1998 (DPA) is an Act of Parliament of the United Kingdom of Great Britain and Northern Ireland which defines UK law on the processing of data on identifiable living people. It is the main piece of legislation that governs the protection of personal data in the UK. Personal data must be obtained fairly and lawfully. The data subject should be informed of who the data controller is (the institution); who the data controllers representative is; the purpose or purposes for which the data are intended to be processed; and to whom the data will be disclosed. For students this is done by the University during registration. Personal data processing may only take place if specific conditions have been met – these include the subject having given consent or the processing being necessary for the legitimate interests of the data controller. Additional conditions must be satisfied for the processing of sensitive personal data, that relating to ethnicity, political opinion, religion, trade union membership, health, sexuality or criminal record of the data subject. The Act covers personal data in both electronic form and manual form (e.g. paper files, card indices) if the data are held in a relevant, structured filing system. Personal data must be kept accurate and up to date and shall not be kept for longer than is necessary. Appropriate security measures must be taken against unlawful or unauthorised processing or disclosure of personal data and against accidental loss of, or damage to, personal data. These include both technical measures, e.g. data encryption and the regular backing-up of data files and organisational measures, e.g. staff data protection training. Personal data shall not be transferred to a country outside the European Economic Area unless specific exemptions apply (e.g. if the data subject has given consent) this includes the publication of personal data on the internet. The Information Commissioners Office publishes guidance and recommendations for businesses regarding all matters related to personal information and the full Data Protection Act is available if you require further information. For expert, up-to-date advice and guidance on IM&T and Data Protection issues (including the new May 2018 General Data Protection Regulations legislation), get in touch with Magikos IT by clicking on the button below. Alternatively, follow the link to the ‘Contact’ page.